In the next few days, leading up to the start of the Stanley Cup Finals in which we will see the Vancouver Canucks trying to hoist Lord Stanley's Cup for the first time ever, I am going to write a little something about the two very memorable Stanley Cup runs previously put together by the Canucks, the first in 1982 and the second in 1994. If any sports team is worthy of the label 'Cinderela team', undoubtedly it's the 1982 Vancouver Canucks. The 82 Canucks, not exactly a team full of talent and skill, where a hard working bunch which included some colourful characters, none of which more colourful then Dave 'Tiger' Williams and defencemen Harold Snepsts. 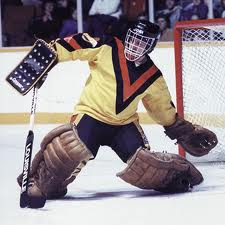 What the 82 Canucks did have in their favour, however, was goaltender 'King' Richard Brodeur (below) who in many of the games leading them to the Stanley Cup final that year, carried the team on his back. After finishing the regular season with more loses then wins (or in other words, a below .500 record), the Canucks started their Stanley Cup campaign by eliminating, first, the Calgary Flames and, second, the Los Angeles Kings. The Conference final matchup against the Chicago Blackhawks, however, would bring about an episode that would forever leave it's mark in ice hockey. 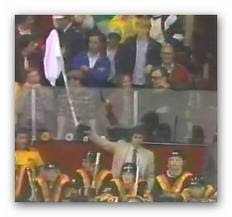 In game 2 of that series, Vancouver coach Roger Neilson, fed up with the performance of the officials in the game, placed a white towel on the end of a hockey stick and held it up like a white flag, in a mock surrender (see below). A few Canuck players followed suit and Neilson was ejected from the game. 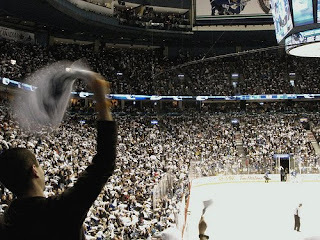 In the game to follow, back in Vancouver, in tribute to Neilson's actions one game earlier, fans brought white towels to the game and began waving them above their heads. On that day in Vancouver a tradition was born - Towel Power - today pretty much a play-off tradition in hockey rinks everywhere. Vancouver would go on to eliminate Chicago only to be dispatched in 4 games straight by the powerful New York Islanders. By then a whole industry had commenced based on Towel Power. Below is an example of the towels produced for the Canucks-Islanders series with the Canuck battle cry. As far as Neilson, while he spent 25 years in the NHL, taking on various coaching duties, he will forever be remembered for the white towel act. 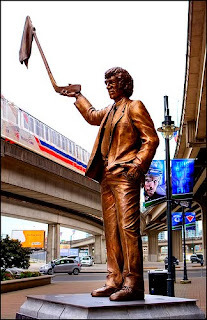 In fact, in Vancouver, outside Roger's Centre, the home of the Vancouver Canucks, now sits a statue of Neilson as a rememberance of that day in Chicago.